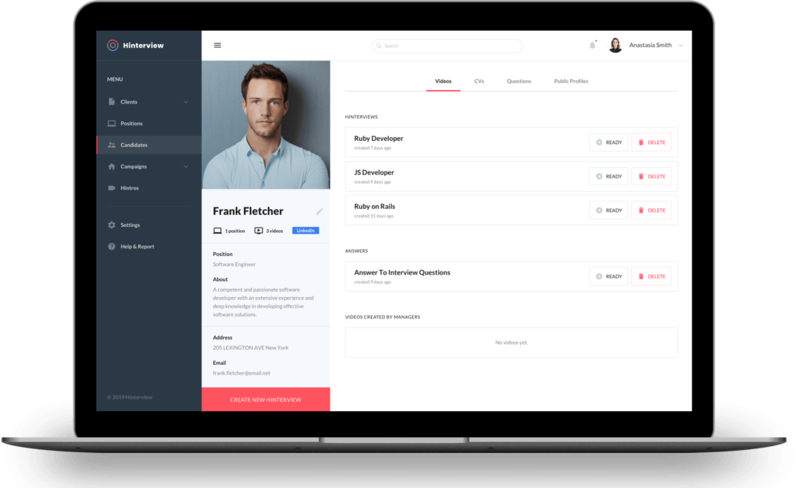 Hinterview is the first video-enabled recruitment platform designed to match recruiters’ needs. The platform provides all necessary tools for running video recruitment campaigns, managing candidate profiles, and communicating with platform users. Hinterview shortens the recruitment process and removes location barriers. As experienced recruiters, Richard and Andy wanted to simplify the recruitment process. They decided to create their own recruitment software using video technologies. When Richard and Andy reached out to RubyGarage, they already had their project in production. 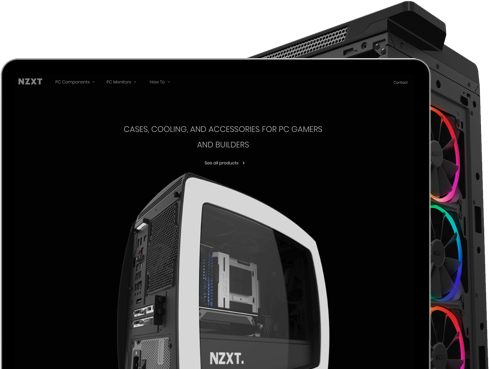 But the existing product had a low conversion rate because of limited functionality and an old-fashioned design. 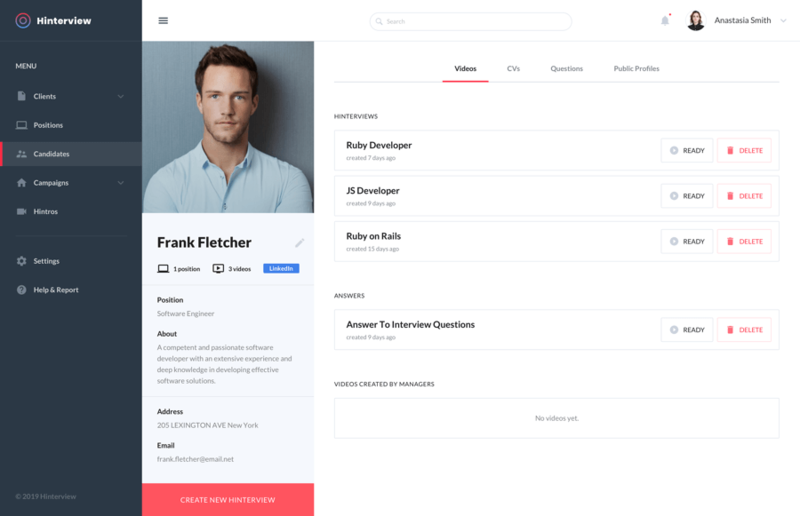 The Hinterview founders were looking for a reliable technical partner to estimate their project, detect bottlenecks, and give the platform a new appearance to entice lots of new, long-term customers. 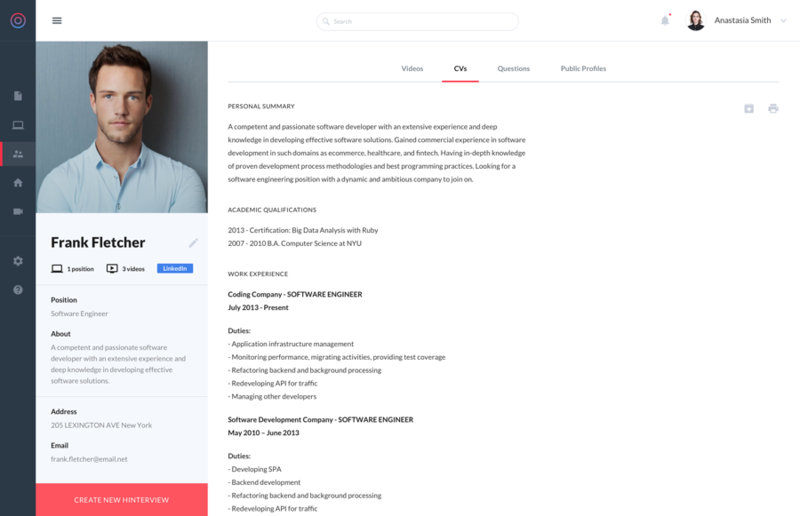 Each candidate profile includes a short description, CVs, all recorded video interviews, and public profiles they’ve created for different positions. A recruiter can either watch the full video or use bookmarks to skip forward to the questions they want to hear. The RubyGarage team overhauled the existing platform and its codebase. 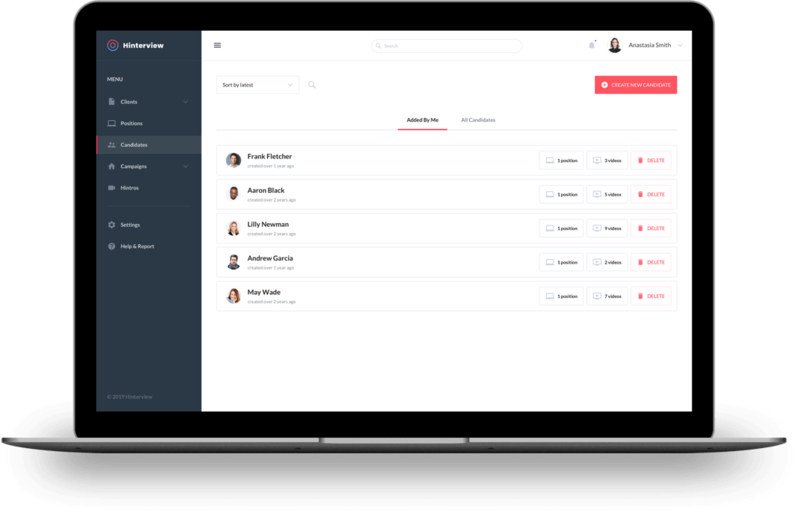 To make the existing product more stable, we made several fixes related to recording videos, managing candidates, managers, and clients, and adjusting profile settings. Our development team applied acceptance and unit tests to ensure the correct operation of the platform while implementing new features. We also used the Sidekiq gem to streamline time-consuming tasks such as video information decoding and file conversions. Hinterview is currently one of the world’s fastest-growing platforms for recruiting agencies. Hinterview allows customers to manage the entire recruitment process in a timely manner. Our RubyGarage team has revamped the Hinteview platform and extended its functionality. Today, we’re constantly scrutinizing the existing product, removing unmaintainable solutions, and fixing bugs so that the platform works properly. The solutions delivered by RubyGarage help speed up the recruitment process and cut the time a recruiter spends interviewing by 70 percent on average.